In this paper we propose first an approach of studying the so-called two-armed bandit problem which is essentially based on the theory of random systems with complete connections. Next we apply stochastic approximation techniques for finding an optimal strategy. For detailed proofs, see [2–5]. In Section 1 we present some basic definitions and several results from the theory of random systems with complete connections. 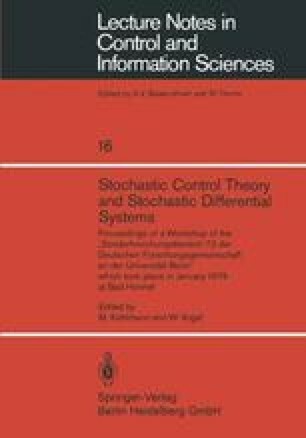 Next we adapt several concepts concerning general control systems, which we developed in a previous paper , to the actual circumstances. Further we deal with the two-armed bandit problem under two possible decision procedures. The first procedure is based on learning techniques, whereas the latter is based on sequential techniques. In both cases we examine the expediency and the optimality of these procedures. In Section 2 we propose an optimal strategy for the two-armed bandit problem by making use of the Kiefer-Wolfowitz stochastic approximation procedure. We further apply the same technique to a market pricing problem. Work supported by the Deutsche Forschungsgemeinschaft, by the Natural Sciences and Engeneering Research Council Canada grant A-7223, and by the Quebec Action Concertée grant 2662.